Yes, something as innocent as a brownie can at times draw out incredibly thoughtless comments. It’s as if some people have an aversion to gluten-free food. A firm belief that it can’t be good because it is different. Maybe they associate it with being sick, instead of understanding firsthand that it facilitates healing. Maybe they equate a gluten-free diet to being deprived. So, what if the most famous chef in America known for having the highest standards put his stamp of approval on something gluten-free? What if he served it at his restaurants? 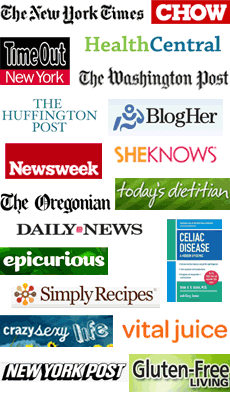 How do you think this could change the stigma associated with following a gluten-free diet? Food aficionados will recognize the name Thomas Keller or at least the name of one of his famous eateries such as French Laundry, Per Se, Bouchon. In my opinion, he’s the Ferran Adria of the United States. Well, imagine how this little food blogger felt when I was invited to attend a gluten-free tea at Per Se Tuesday, November 1st to celebrate the launch of Keller’s latest venture! Keller partnered with fellow French Laundry Chef Lena Kwak in order to share her creation of Cup4Cup gluten-free all purpose flour with aspiring bakers everywhere. My friend Christine excited about her gift of Cup4Cup. She’s not gluten-free, but she’s a huge Keller fan. She said everything tasted outrageously delicious. I didn’t know what to expect, other than the best of the best. I didn’t even know if Thomas Keller would be there, since I had seen on Twitter he would be on the Martha Stewart show at 10:00am and the tea was at noon. You can probably picture my surprise when immediately upon walking through the famous blue door my friend and I were greeted by what appeared to be Thomas Keller himself! Now, I rarely get starstruck. Really, I used to work across the hall from Starr & Company, where celebrities walked by my glass doors every day. On occasion I got to see people make fools of themselves over someone like Al Pacino, Joe Torre or Julius Irving. For some reason though, perhaps caught off guard by Chef Keller’s warm welcome, I felt as if I’d just met Sir Paul McCartney or something!! I was almost speechless, something that doesn’t happen to me very often! Have You Ever Seen A Fancy Donut Hole Server? Complete With Tiny Spice Holder To Roll Them In. “Tom” was great at working the room full of writers from all of the top food magazines and websites. I bumped into him munching near the savory table and he highly recommended the flat breads. There was no trace of cockiness or a condescending attitude you might expect from a famous chef. He had a super approachable down-to-earth demeanor. In fact, as the room emptied, he suddenly appeared before us with an invitation to tour the kitchen! Overall, the whole vibe at Per Se wasn’t hoity toity. It doesn’t seem to be about attitude, it’s all about excellence. Chef Lena Kwak, the creator of Cup4Cup all purpose gluten-free flour. It turns out that originally Kwak had the assignment to figure out how to create a gluten-free version of Keller’s famous salmon cornet. After creating an all purpose gluten-free flour blend, she then used it to make breads and pastries. The story goes that once a guest at The French Laundry started crying after eating a gluten-free brioche, Keller and Kwan decided to make the blend available to the general public. Now you can buy it at Williams-Sonoma and Bouchon bakeries nationwide. A 3lb bag retails for $19.95. Look how they served the ice cream sandwiches…with dry ice! It was an excellent tea and an amazing, perhaps once in a lifetime experience! I felt deeply honored not only to meet Thomas Keller and Lena Kwak, but to be able to personally thank them for attaching their names to a quality gluten-free product. I truly believe this can only benefit those of us that have to eat gluten-free. It sends a message to the world that we can enjoy excellent food! We can enjoy living gluten-free! Thank you again, Thomas Keller and Lena Kwak!!! Hey Aileen! Well, I didn’t actually taste the gf pastry treats. The flour mix has corn and dairy in it. :/ But, true to most food centered events, the real joy was in the company! And I enjoyed the beauty of the food too! At one point Keller asked me if I had enjoyed the pastries and I sheepishly explained my additional issues with corn and dairy. He said, “Well, we’ll work on that with the next mix.” heh heh I think he was joking. sounds to me like you can’t count on him joking. Nothing is impossible! Thanks again. Do you know what flours are in the mixture? We don’t have either store here. I’ll mention it to Lena Kwak that they might want to make it available on Amazon for those of you that don’t live near a William-Sonoma or Bouchon. Wow. That was quite an experience. Kelly – You met KELLER?!!! Dear God, this all looks amazing. What a fortunate lady! Can’t wait to try this flour. We do have a Williams-Sonoma store close by, yippee. I have been baking cupcakes, muffins and brownies using the BC cake mixes for my base. I love baking, and I’m sure this will be a new experience for me. Thanks for sharing this info. Awesome! So jealous. Thanks for so many pictures. I purchased the GF waffle and pancake mix recently and it is A-MAZ-ING! By far the best I’ve ever had. Can’t wait to try the flour. Stacy….Cup4Cup has a waffle mix? Where did you buy it? I didn’t know about it. Heard about the brownie mix. It was wonderful to read that Chefs Keller and Kwak elevated the gluten free status to gourmet! While reading and perusing the photos, I was fantasizing about the taste. Mmmm. Do you know which flours are in Chef Kwak’s Cup4Cup GF flour mix? Anything different than the usual? Wow this is so cool! Glad to hear this mix really works. I would have loved to have been there with you, if just to see you speechless! This looks amazing! I was just saying that I wish more restaurants would have a gluten-free tea service – do you know if Per Se will be offering that, or was this just for the bloggers and to present the new product? Thanks for the 411 can’t wait to go to William sonomab to get the flour! Wow, just wow! How fabulous for you to be there, and to meet Thomas Keller! The pictures are fabulous and the food looks scrumptious – GF Danishes!? I will be happy to use my William Sonoma discount to try this flour mix, my 2 celiac sons will be over the moon if I can make anything that looks and tastes half as great as what you must have had. There are some fun recipes on the Cup4Cup website. And Lena Kwak will be happy to answer any questions you may have via Twitter or FB. So, don’t be shy. She also is excited to hear about anyone’s experiments. If you make some danishes be sure to show her some photos! Have fun! OH, and come back here and tell us how it worked out too! Thanks for sharing! We all dream of tea at Per Se, and to think of a GF tea….that is very special. Can’t wait to try the flour. Have already bought the Bouchon bakery GF brownie mix at Williams Sonoma, and it rocks! Keep up the food blogging; we are living thru you! Gina!!! It makes me so happy to know you enjoyed reading this! And thanks for the review of Bouchon Brownie Mix! What an awesome experience, kind of like Alice in Wonderland but better! Drooling as I peruse the photos. I live in Canada and there are two William-Sonomas in the city, so I’m sure I’ll find it there. Hoping there is no corn in the blend! Thanks for sharing. “Well, I didn’t actually taste the gf pastry treats. The flour mix has corn and dairy in it. :/ But, true to most food centered events, the real joy was in the company! And I enjoyed the beauty of the food too! Looks so fabulous! Being English I’m always wishing for a GF tea. Have fond memories of the French Laundry, now live in Chicagoland. Thomas Keller is an amazing chef, thanks to him for his flour and helping to bring GF mainstream. looks amazing Kelly! I wish Barcelona were a little closer to New York!!! I wish Barcelona was closer to NYC too!!!!! Sarah…yeah, I’m with you, Baby. Thanks for finding and posting the ingredients. I just posted this to another commenter…thought you might find it interesting. No problem, Kelly. Sorry to hear you are in the same boat – multiple food intolerances can be overwhelming at times, but I’m surrounded by people with them – I co-moderate a group on FB and several of my fam are also gluten intolerant/celiacs. I’m hoping that one day I will at least be able to reintroduce dairy – that would make things a lot easier. I’m also intolerant to eggs right now too as well as the nori in sushi (plus several other more minor intolerances), which is just a bit much to deal with all at once. It’s great that this celeb chef is raising awareness for gluten-free. It must have been terribly hard dealing with celiac/gluten intolerance years ago before there was such awareness and such an array of gluten-free products. Thank you for sharing your joyful experience at Per Se in New York. I’ve been living gluten free since 1987 or so and live right down the road from the French Laundry in the Napa Valley. I’m more and more delighted with how many gluten free products are now available. I do love baking with gluten free flour and almond milk, so I’m a happy girl. Thanks again for helping to spread the word and my heart is glad that Thomas Keller and Lena Kwak are also responding. So cool! I had the pleasure of dining at French Laundry last year and got those GF salmon coronets, along with the other special GF accommodations they made for us. It was amazing. I don’t believe this flour is probably any better than others we have all been using, but it’s more about the big name attached to it. It’s nice to have validation from the top chef in the U.S.! WOW! This is super exciting news! I’m going to have to get my hands on this and see how it tastes!! a bit pricey, but if the texture is spot on, then it may be worth it once & a while! I. Am. Jealous. Looks great! And, your photos are really awesome! I’m glad you were able to go and then share so we can all enjoy the experience vicariously! Shellay!!!!!! ahahahahahhahahah So nice to see you around here! Glad you enjoyed the recap! Thanks for the props on the photos. Mwah! I’m a little behind since I’ve been swamped at work. This is amazing! i don’t know what is more exciting, meeting Keller, seeing all that scrumptious food, or being able to now cook and enjoy what I eat. thanks so much for all the info.including the W&S site for ordering. No wonder they invited you! You and Keller and Kwak will make my day, week, month, and maybe year. Can’t wait to try all items. Wow Kelly that food loves absolutely D-I-V-I-N-E!! I am immediately feeling hungry. How fabulous to see a top chef so committed to gluten-free delights. Hi Kelly, I’m glad you had a fairly good experience. Being star-struck, or I should say, chef-stuck, is fun and it’s flattering to be invited there. However. There are several elements of this ‘discovery’ that I find distressing: the cornstarch, which could easily be substituted with arrowroot powder, the addition of milk/dairy, and the xanthan gum which is a soy product. And, of course, the huge price. Gluten free adjustments to your diet is great, if you absolutely need to eat that way, but it has become a fad for people who think they can’t have gluten. Just about everything that is gluten free also contains large amounts of sugar. It boggles my mind. I came up with a gluten free oatmeal (gluten free version) cookie but when I tested it with that wacky kit that costs $35 for 2 tests, it did not proof. Don’t know why. Probably because I don’t bake them in a gluten free dedicated space… They are still good for people who like to have gluten free oatmeal cookies but probably not for true celiacs. Business people will always see a market and jump in for profit. This looks wonderful! I’m sure that if Thomas Keller puts his name on something it will be good. I can’t wait to try these in my next trip to NYC!! Looks so fabulous! Being British I’m always hoping for a GF tea. Have attached to reminiscences of the People from france Washing laundry washing, now reside in Chicagoland. Johnson Keller is an awesome chief cook, thanks to him for his flour and assisting to carry GF popular.